Established in 1860 and designed by landscape architects, O. C. Simonds and H.W.S. Cleveland, Graceland is truly a haven in the city. Chicago's most famous people are buried here. The monuments and buildings designed by Sullivan, Holibird & Roche and McKim, Mead and White, among others are still viewed as primary examples of their work. This masterpiece of Midwest landscape architecture was awarded a medal of excellence at the Paris Exposition of 1900. Graceland was also honored by acceptance on the National Register of Historic Places in 2001. Landscape historians regard Graceland Cemetery as "one of the most remarkable park-like cemeteries of the Western world." This giant of commerce is commemorated in a memorial created by the two men who later would be responsible for the Lincoln Memorial – architect Henry Bacon & sculptor Daniel Chester French. Field, who went from store clerk to Chicago’s richest man, developed his famous company into the world’s largest wholesale and retail dry goods enterprise. 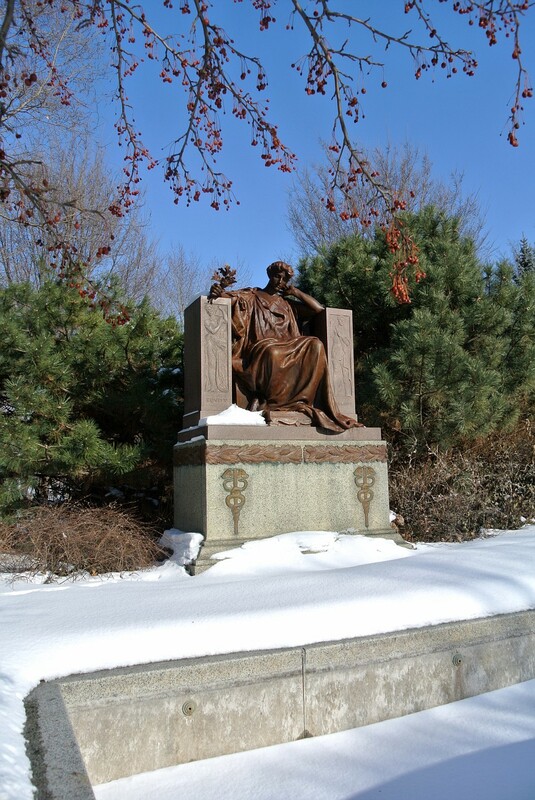 French’s statue, the sad-faced woman titled “Memory,” holds oak leaves, a symbol of calm courage. The caduceus on the base, the staff of Mercury, is used today mostly to represent medicine. But we are told that here, it stands for commerce. Mercury was the classical god of commerce – as well as of skill, eloquence, cleverness, travel and thievery.